Need some new outdoor furniture ideas to get your backyard ready for barbecues, pool parties, and quiet evenings under the stars? There are lots of ways to liven up the patio or yard beyond just arranging lawn chairs around your grill. When considering outdoor furniture options, most people think of typical aluminum lawn chairs, wooden picnic tables, plastic patio sets, or even aluminum patio furniture sets complete with a few chairs, cushions, and umbrellas. Those items are fine, but there are certainly more options available. If you want to give your outdoor area a different type of look, there are plenty of choices. Looking for a chic little option for you and one other person? Enjoy brunches or late dinners with wine under soft lighting by setting up a bistro set on your patio. Bistro sets are generally small tables with two chairs. They're often made of metal with intricate detail. If you're often away during the day when summer storms may be brewing, and you also often forget to bring in cushions or secure your outdoor furniture, concrete furniture may be a good bet. Barring the worst storms, a concrete set is probably not going anywhere, whether you forget to attend to it or not. Toasting marshmallows while chatting away has never been easier. 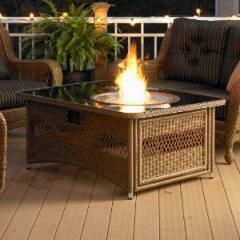 Tables with built in fire pits allow you to have light, warmth, and effortless s'mores. You get the benefits of a campfire in a controlled environment. You don't have to worry about dragging out and positioning chairs around a fire every time since they're already at the table. Patio sets come with umbrellas attached to offer shade during the day, but did you know that those same umbrellas can offer light at night? SolarPanelsPower.net shows how patio umbrellas with attached solar panels can collect energy during the day and offer light for meals and chatting at night when a fire's unnecessary or unwanted. Though patio tables and chairs come in a wide variety of styles, there may not be as many colors or patterns as you'd like. Many are done in neutral or at least muted tones. Don't shy away from adding some bright paint to your chairs that pull up to a wood-toned table for a festive, contrasting look. 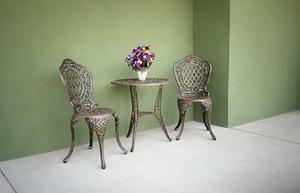 DIYideas.com has a slideshow of painted patio chairs to take inspiration from. Consider stripes and roses spray painted onto wicker or wood, for example. Gazebos aren't new, but not everyone has the yard to accommodate a full-size one. A new take on the fancy gazebo style is the portable gazebo, which you can find in home and garden stores. Choose the fabric and color that will complement your home and your other outdoor furniture. You won't want to leave it up indefinitely. Take it down and put it away when it's not in use in order to extend its lifetime. DIY Ideas shows how you can use a tree stump as a stool at your picnic table. Add a cushion of your choice (make sure it's attached well) and you'll have an extra seat with very little effort or money. If you previously bought a collection of aluminum and plastic outdoor furniture pieces only to be let down when they didn't hold up to the weather, the UV rays, or time, consider upgrading to teak wood items. This will be more of a financial commitment, but teak tends to stand up well to moisture and sun. You also don't have to worry about taking it inside when it's not in use. Before embarking on your search for upgraded furniture for your patio, deck, or yard, decide what's important to you. If you have money to spend, you may be interested in a more expensive selection, like teak furniture. If you need a modern update but you're on a budget, purchasing inexpensive wicker chairs and spray painting them in colors that lift your mood as soon as you walk outdoors may be the best solution. There are plenty of new outdoor furniture ideas to go around, regardless of the space you need to decorate or what your personal preferences are.